Home › FAQ › How Much Do Textbooks Cost? To figure out how much textbooks cost, it helps to have some perspective on the rising costs of course materials and school supplies. Since the late 1970s, the increase in textbook costs has outpaced housing costs, inflation and college tuition, and the average student can expect to spend $1,000 to $1,200 per year on books and other supplies, according to the Huffington Post. The most expensive textbooks can cost almost $300, and most large textbooks cost between $100 and $200. It isn’t always necessary to pay the full price for a textbook, and you can find most books for free or at dramatically reduced prices online in e-book format. There are also online retailers that sell used hardback textbooks at huge discounts, and if you can’t find a used version of the book a professor assigns for your class, you can always buy an older version and find a way to access the missing material from another person’s book, a website or the library. The university library usually has a large selection of textbooks students can borrow while remaining in the building, and you can always scan pages from these books and put them on your computer. Another place to get reduced prices on textbooks is on an e-textbook rental website, such as Barnes & Noble or CourseSmart. If you can’t find an e-book for free on Google Books or in PDF format somewhere else on the Web, you can almost always find the book for rent on an e-textbook website. The cost difference between renting and buying textbooks is usually fairly large, but not always. Some books are already inexpensive in hardcover format, so you won’t save much money by renting the e-book version. Additionally, when you rent textbooks, you can’t resell them after the semester, and you can’t keep them when the rental license expires. You can, however, print most or all of the pages from the book before the license expires, although it’s not quite the same thing as owning the hardback textbook. One point to mention is that you should always make sure the copyright owner of a textbook knows that a book is being offered for free online before downloading a PDF, EPUB or MOBI file, because you could face litigation if an illegal download is traced to your IP address. Plus, it’s unethical to take income away from the textbook author. There are still thousands of textbooks and other course books available in e-book format for free, especially books that were published prior to 1924. For example, the website Gutenberg has a vast library of public domain books and textbooks in EPUB, HTML, Kindle and other formats. 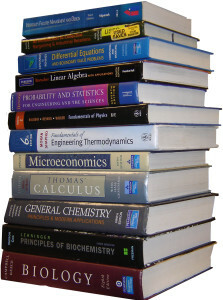 Professors often assign supplemental reading materials, and websites like Google Books and Gutenberg.org have a lot of these books available for download. Some classes don’t require students to buy textbooks, but the cost of course materials is factored into the tuition. For example, online courses and classes that are taken through a university’s online portal often have textbooks included in the student’s account dashboard. If you’re concerned about student debt and want to keep your educational expenses down, there are many steps you can take to avoid paying the full price for learning materials. When planning your semester budget, consider how much textbooks cost and what your alternatives are.